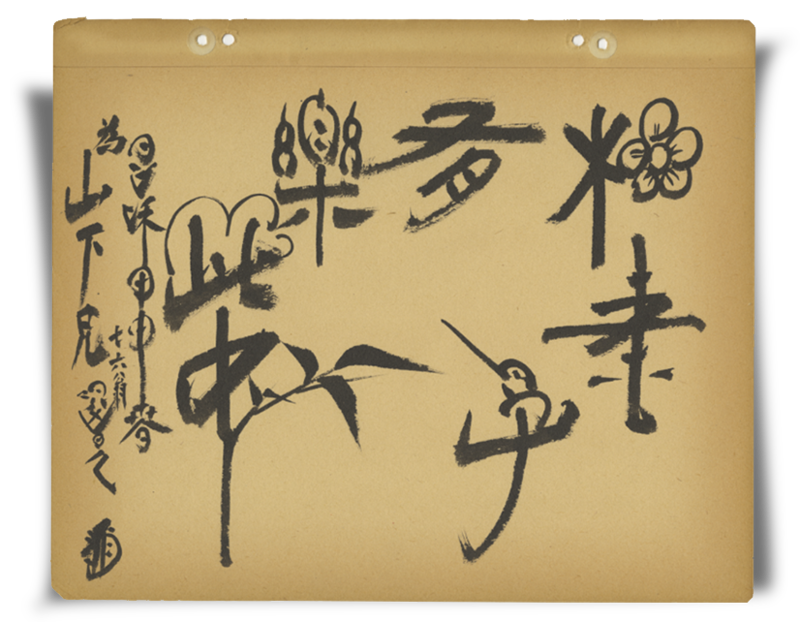 This calligraphy piece is a combination of pictures and Chinese characters, with pictures making up parts of the characters. It is meant to be a playful and fun way of writing the letters. What is a suiban and suzuri? Suiban are shallow trays used to display miniature rock gardens or flower arrangements. Suzuri are inkstones used for calligraphy. Ink comes in a solid stick form that dissolves in water. Water is poured into the inkstone, and then the ink stick is rubbed against the wet base of the stone until the ink dissolves. Utai is the vocal portion of Noh. Noh is a form of Japanese theater that dates back to the 14th century. Chikubu shima is a famous old Noh play. The name comes from a small volcanic island in Lake Biwa, a famous lake near the ancient imperial capital of Kyoto in western Japan. What are zori and geta? Zori are flat thong sandals made of straw. Geta are wooden platform sandals. Both men and women can wear either type of sandal. Date unknown, Letter from Gihachi to Tsugio, translated from Japanese. Since arriving here, both my emotions and spirit have settled down and I have been putting more effort into self-improvement. February 14, 1942, Diary entry by Gihachi, translated from Japanese. When you have a lot of time, it isn’t difficult in this place to waste time without realizing it. Each Sunday there are talks/sermons from each of the religions. Recently, in this building for an hour each, there have been lectures in calligraphy, English conversation, English letter-writing, American history, and law. I too, when not on duty, go and listen. I too am working as much as possible towards self-improvement. November 12, 1942, Letter from Gihachi to Lillian, written in English. I was so busy last 2 weeks as we had a exhibition for 3 days and I was on committee. We exhibited all kinds of things we made and pictures writing too. I exhibited two writing which was very good for me. The exhibition was so gorgeous and was success. The exhibition hall is closed now but things are still displayed yet as we got to show for Army’s big men who are coming soon to see them. I am little busy now to finish my job making a quite big suiban out of the famous shell rock here. Beside friends ask me to make “suzuri” too. February 24, Letter from Gihachi to Tsugio, translated from Japanese. On top of that, in 2 or 3 days, utai will be added. Yesterday, the papers that had not been handed over for a long time were finally distributed, and I too received my utai books. So suddenly I will start up with utai lessons. March 9, 1942, Letter from Gihachi to Tsugio, Lillian, and Angela; written in English. I have just finished the chikubu shima, the utai, today. About 10 people in the class. Mr. Nagamoto is very good, and fancy singer. Dr. Amano and I are only man that knows more. And I am just started the shuji too. Many thing I can learn if I try to learn. Noh singing made me very happy. That I had to stop dance class just when it was no longer difficult and I could really practice was really regrettable. June 8, 1942, Letter from Gihachi to Tsugio, Lillian, and Angela; written in English. Tomorrow we start the utai singing again. We are kind hurry to study more of it because we mighty lose our teacher Mr. Nagamoto as he signed for “yes” to go to Japan. November 9, 1942, Letter from Gihachi to Lillian, written in English. I am sorry it was so late to send you getas but they are all ready now to send to you. We can send just one 6 pounds package in a month. Those getas for you are too good to be use in bath. If you need some getas for bath use I will send you more unpainted getas all you want. Contribution to Gihachi’s scrapbook by an acquaintance. 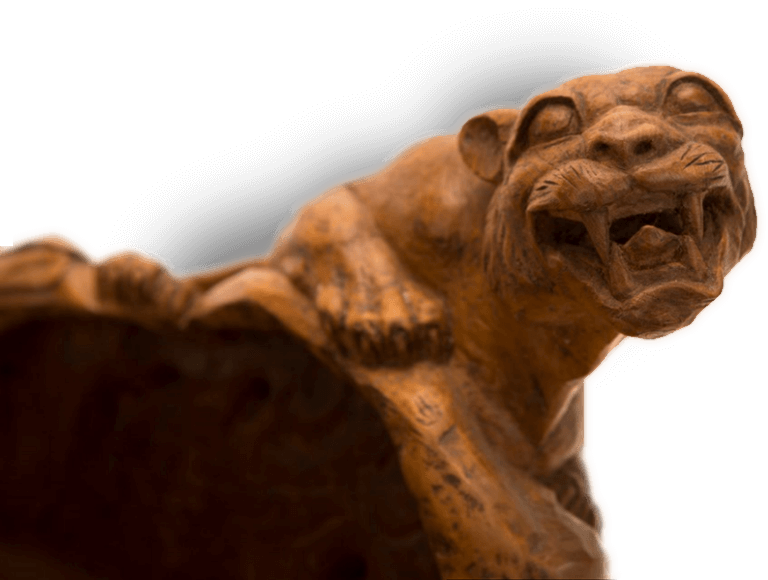 Carving by Harry G. Koizumi. 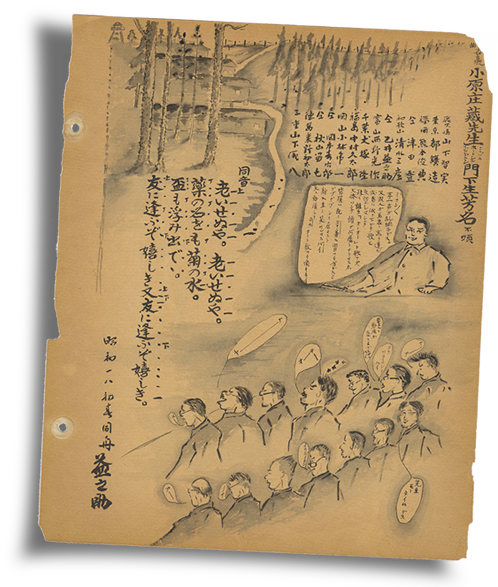 Illustration of utai (Noh singing) class, contributed to Gihachi’s scrapbook by a classmate, while both were interned at Camp Livingston, Louisiana. 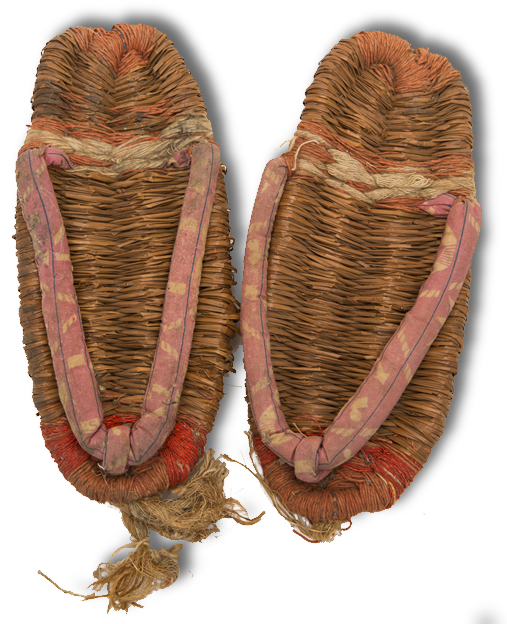 Zori, or woven straw sandals, Gihachi made for his family, The thongs are made from used fabric sacks he asked Tsugio to send him.